Whenever someone mention that they are working in Imtiaz Super Market, people ask which branch? So, firstly, every market or mart or store which is expanded to this level, do have a head office, or can have a head office too. Imtiaz Super Market has a head office where they have HR dept, its audit dept, its finance dept and the list goes on. From where its CEO watches all the branches, functions and dept through a hawk eye view. Now do you know how many branches does Imtiaz Super Market have, total branches, their locations and their presence hitting which areas? Let’s explore this journey with me, which many of us doesn’t know, including me. I have only witnessed Imtiaz Super Market few branches, means personal visits and shopping experience. As a child I use to know one and only branch and that is Bahadurabad branch, the first ever store from which they had grown to such a new level. Talking about its first ever branch, Bahadurabad, it was initially a really small and congested shop, I use to visit it with mum for grocery. The range of edible grocery is amazing, you can get anything to everything there, from herbs to pluses, rice to wheat, along with the guarantee of being clean and the price is so affordable along with the packaging, like from a small amount of herb to a full package, from minimum to maximum quantity. Later on, I use to visit Imtiaz Super Market, because of medicines. Imtiaz Super Market provides more discounts on medicine than any other Super Market in Pakistan, i.e. 12% of discount. After almost 8 years, because of increase in demand for Imtiaz Super Market and the crazy or massive footfall they thought of opening another branch, right beside passport office, and why not? I mean, while waiting for the turn why not go and buy some stuff or even after getting free from all the hassle why not some beverages or things like frozen food to buy? Even this branch got a huge response, as per Imtiaz Super Market amazing price range, it has attracted and gained more popularity amongst people. 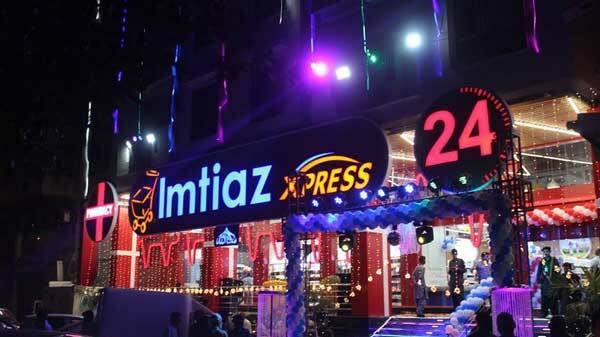 Initially Imtiaz Super Market was famous only in range of normal middle-class families, after this branch, it got a lot more attention, even from upper class. To divert such an amazing response and foot fall, and to ease out the customers, for more facility Imtiaz Super Market opens its two more branches, one in DHA and other in Nazimabad. Two big branches allowing more capacity of people to shop and enjoy ultimate shopping experience. People from other cities who came on vacations even, use to shop and go back with the items, mentioning the fame on their social channels, which make Imtiaz more confident to grow and expand its wings outside Karachi too. Moving to Punjab sector, Imtiaz Super Market opens up at Faisalabad and Gujranwala, to serve more and more people. Because their mission is to unlock the potential of customers buying power to improve their quality of life. Coming back to the city where it all started off, “From an inception to a bigger reality”. They again planned for more expansion, this time they target the most populated area “Gulshan” along with a mindset of going larger as per area than any other branch, to facilitate more people. Regardless of parking issue faced by people, still Imtiaz has a massive footfall along with a great demand for groceries and other stuffs. They have opened few more branches in this year, near Malir, because all the branches were at a distance, and people were demanding a lot more than expected. Then coming back to the same area, near Tariq road and at Sharfabad. Oh! Did I mentioned that Sharfabad branch is Imtiaz Super Market express, which means, they are serving customers like 24/7? Stick with us to know more about Imtiaz Super Market. Will be revealing some more facts and figures. Do you know how many categories are there in Imtiaz Super Market? If no, then stay with us to know more facts about Imtiaz Super Market. Until next time. Stay happy and blessed.